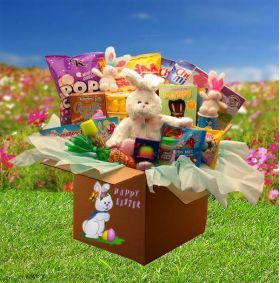 Our largest Easter Fun Care Package for an entire family or one huge gift for a special Little friend. Filled to rim and overflowing with Easter goodness and activities. 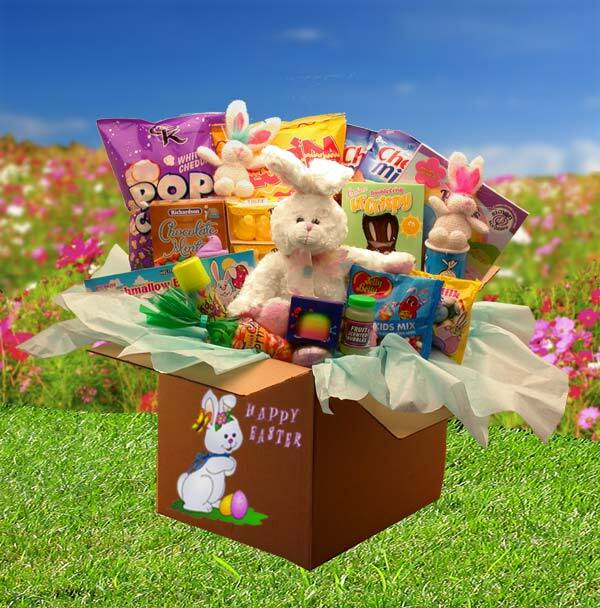 The Easter of Fun Family Deluxe Care Package includes: 12" plush Easter bunny, 2 mini plush Easter Bunnies, 14 oz Tortilla chips, 2 check snack mix bags, 12 ox white cheddar popcorn, Tootsie roll bank, Easter peeps, Silly string, 2 jars Fun dough, egg crate full of milk chocolate covered marshmallows, pastel magic spring, milk chocolate Easter bunny, carrot patch candy corn, Peeps Easter coloring and activity book, fruit flavored bubbles, jelly beans, malted eggs, pastel chocolate mints and complete with a happy Easter bunny adorning the outside of the box. A sure delight for families and kids of all ages.